Dinner with wine used to be simple. The rule was white wine with white meat and red wine with red meat. But most of us don’t just eat meat and potatoes or drink claret and Chablis these days. When the marriage of food and wine works well, each enhances the other, making the meal greater than if you had consumed them separately. That’s why the following classic matches have survived the changes in food fashion: Stilton with port, foie gras with Sauternes, boeuf bourguignon with Burgundian Pinot Noir and goat cheese with Sauvignon Blanc. It helps to start with the basic principles of food and wine pairing, as they still provide a basis for experimenting with New World cuisine. One of the most important elements to harmonize between wine and food is flavor. For example, a tangy tomato-based pasta sauce requires a wine with comparable acidity. Without this balance between the acidity of the dish and the wine, the partner with lower acidity tastes flabby and dull, while the other seems too tart. To find a comparably acidic wine, choose one that is made in the same area as the food. Years of matching the regional cuisine and wine as well as similar soil and climatic conditions make this a safe bet. For example, you could pair a tomato sauce fettuccine with a Tuscan Chianti. Or you can select a wine from a cool climate where the grapes don’t ripen to great sweetness, and maintain their tart, tangy edge. 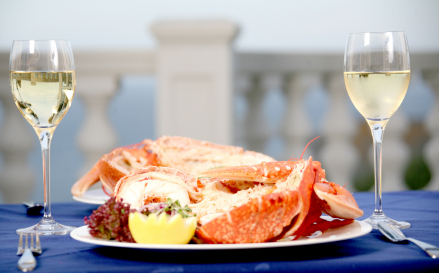 Crisp New Zealand Sauvignon Blancs and French Chablis serve these dishes well. Acidic wines also work well with salty dishes. For example, oysters are both salty and briny with an oily, mouth-coating texture that can smother most wines. However, a sparkling wine from California, a Spanish cava or French Champagne can both refresh and cleanse your palate when eating fish. Bubblies also work well with spicy foods. Hot spices in Asian, Thai, curry and chili pepper dishes can numb the palate. Many of these foods also have high acidity from citrus ingredients such as lime juice as well as sweetness. Therefore, you need a wine with an acidic backbone as well as a touch of sweetness, such as an off-dry California sparkling wine with lots of fruit. While off-dry, acidic wines go well with many dishes, the two most difficult wines to pair with food are also the two most popular: Chardonnay and Cabernet Sauvignon. New World Chardonnays can be oaky, buttery, flavorful wines that overwhelm many dishes. But you can still enjoy Chardonnay with your meal. Pair it with butter and cream sauces to marry similar textures and flavors. Conversely, Cabernet Sauvignons can have bitter dark fruit flavors with mouth-drying tannins (the same sensation you get from drinking well-brewed tea). Therefore, they find their happiest match in foods with juicy proteins such as a rare steak. The protein softens the tannin, making the wine taste smooth and fruity. Steaks done with crushed black peppercorns sensitize your taste buds, making the wine taste even more fruity and robust. However, the way in which the dish is prepared also has an impact. A well-done steak, for example, may taste too dry with a tannic Cabernet. Proteins are also at work in the marriage of wine and cheese, the cocktail-hour classic. Red wines tend to go better with hard cheeses such as blue cheese as they can accommodate more tannins. However, whites suit soft cheeses such as Brie and Camembert, as the creamier textures require more acidity for balance. Game birds such quail, pheasant, turkey, duck, squab and guinea hen have earthy flavors that are more robust than chicken. Wild game often goes better with racy red wines that have a gamy quality to them, the classic being Burgundian Pinot Noir. The flavors of Pinot Noir — plum, cherry, mushrooms, earth and even barnyard (that’s a positive adjective) – accentuate the same gamy flavors in the food. Other wine options for game birds include Spanish Rioja, Oregon Pinot Noir and lighter-style Rhône Valley wines such as Côte-Rôtie. When it comes to barbecued and grilled dishes, go for robust reds, such as Shiraz, Cabernet Sauvignon and Barolo. Argentine Malbec is the ultimate summer barbecue wine. With its fleshy black fruit, dark spices and smoky notes, Malbec muscles in beautifully beside most grilled fare: it’s a sizzling combination. One of the most challenging flavors to balance is sweetness. 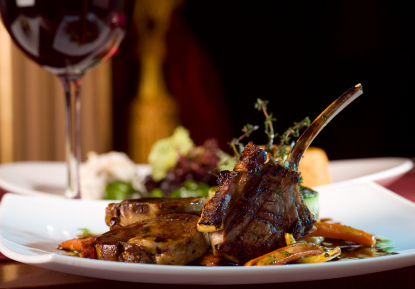 Dishes with a touch of sweetness such as glazed pork do well with off-dry wines such as Riesling and Chenin Blanc. However, rich desserts such as chocolate and crème brulée demand a wine that is sweeter than the dessert, or the wine will taste thin, even bitter. Sweet wines such as Sauternes, Canadian ice wine, late-harvest wines and Port will work not only for their sweetness but also for their unctuous texture. Pair food with wine with my easy-to-use online tool (www.nataliemaclean.com/matcher) or mobile application for your smartphone such as iPhone or BlackBerry (www.nataliemaclean.com/mobileapp). Search by wine if you’re looking for meal inspirations or search by food to find great wine suggestions. In my new book, Red, White and Drunk All Over, I explore food and wine matching in more depth. Natalie MacLean’s bestselling book Red, White and Drunk All Over: A Wine-Soaked Journey from Grape to Glass is now in paperback. 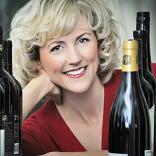 She was named the World’s Best Drink Writer for the articles and wine picks in her free wine newsletter, available at www.nataliemaclean.com.